In his bid to become 1st Ward alderman, Daniel La Spata used the ward’s booming residential and multifamily development to draw a contrast between him and incumbent Proco Joe Moreno. Among his campaign promises were a call for a more inclusionary zoning process and a vow not to accept contributions from developers. That strategy worked, with La Spata pulling off one of the biggest upsets of Tuesday’s election, beating Moreno with 61 percent of the vote. Now La Spata said he’s working to enact the policies he promised. And could mean big changes for developers and landlords in the 1st Ward, which encompasses portions of Wicker Park and Logan Square. La Spata’s vow to forgo donations from developers hasn’t really been an issue yet. During the campaign, developers and real estate industry figures made their preference for Moreno well known, making up nearly 60 percent of all funds he raised since 2018. 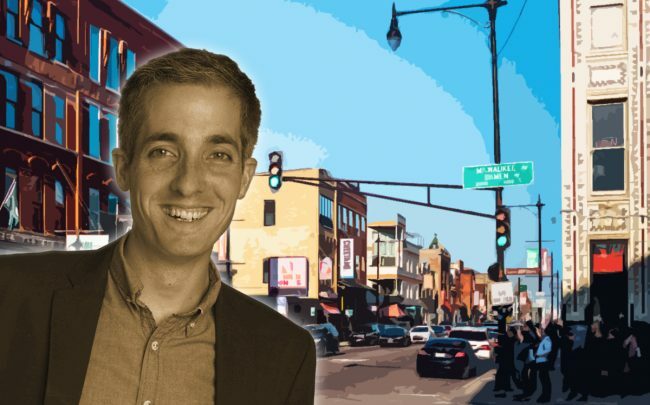 La Spata’s only real estate-related campaign funds came from the Strauss family, who drew Moreno’s ire when they evicted the Double Door from its Wicker Park location. Now La Spata will have power to grant or deny developers’ requests, and he said refusing their money will restore trust in the zoning process and will make the system more fair for developers. “To take the money factor out of it helps to restore trust and restore good faith that community zoning processes are worth participating in,” he said. La Spata has been advocating on housing issues for some time. He cut his teeth working with the Chicago Rehab Network, an affordable housing advocacy group, and the Logan Square Housing Association, where he co-chaired its committee on housing and land use. La Spata said some of the development that’s taken place in his ward — much of it tall rental units buildings by Blue Line stops — has been good for the community. But some has not reflected the needs of the neighborhood, he said. The 1st Ward is seeing a boom in residential and multifamily development, thanks in part to the transit-oriented-development ordinance that allows for more density near train stops and major bus routes. La Spata said the law has done good things for the ward and city, but he said tall, often expensive rental buildings can’t be the only way to add density. That includes maintaining the ward’s stock of two- and three-flats, and working to make sure they aren’t deconverted. La Spata said he also will advocate for adding “gentle density” through the incentivizing of carriage houses and other accessory units. But he’s not on board with further regulating or eliminating single-family zoning, which has been used in cities like Minneapolis to try to promote affordability. Another big issue in La Spata’s campaign was the ballooning property tax bills for some Logan Square homeowners, who saw assessments rise by 50 percent. He said he plans to work with new Cook County Assessor Fritz Kaegi to address the issue.